The heart of Miami can be found in its downtown city center. Downtown Miami is the oldest settled area of Miami. With its multi-million dollar buildings, it is known as the financial and business center in South Florida. A record 15.9 million tourists visited Miami in 2017, with Downtown Miami cited as a favorite destination. Downtown Miami offers museums, art galleries, and shows at its Olympia Theater. Residents and tourists enjoy a dose of warm, sunny weather when strolling down Riverwalk or Bayfront Park. 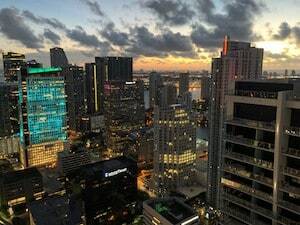 Tourists can experience the urban core of Downtown Miami which is packed with multi-cultural restaurants and cafes, shopping, and historic buildings. With its extensive public transportation system, tourists and residents alike can travel around town easily. The warm weather and sights of the city encourage tourists and residents to walk around town. High pedestrian traffic increases the chance of accidents. Miami is consistently ranked high on the list for dangerous cities for pedestrians. Every year, tourists and residents walking in Downtown Miami are injured in accidents. Whether it is the result of motor vehicle crash or dangerous walking conditions, pedestrians have a greater risk for injury as they don’t have anything to protect them. Accidents that result from drivers that do not operate their vehicles with reasonable care or property owners that do not ensure a safe premise can result in a personal injury claim. If you have been the victim of an accident, contact the Downtown Miami personal injury attorneys at the Wolfson Law Firm. Injuries that result from accidents may prevent you from working. You may also incur high medical costs. Our Downtown Miami personal injury lawyers can help answer your questions about paying for medical treatment and recovering lost wages. If you or a loved one has suffered injuries or a fatality as the result of a personal injury accident and would like to speak to our Downtown Miami personal injury lawyers, contact the Wolfson Law Firm at (305) 285-1115 for a free consultation. Should You Contact a Personal Injury Accident Attorney in Miami? If you’ve been injured as the result of the negligence of another and are wondering what your rights are, contact the Wolfson Law Firm at (305) 285-1115 for a free consultation. If you’ve been injured in a Downtown Miami accident, it is important to seek medical treatment quickly to prevent further damage. Injuries that appear relatively minor may result in great damage and pain if left untreated. To minimize their payouts, Insurance companies are often quick to settle. However, injuries can often be extensive, requiring current as well as future medical care and rehabilitation. Severe injuries may limit an accident victim’s ability to work for a long period of time. Victims should know and understand their rights. Seeking representation will help personal injury accident victims to receive the compensation needed to recover from the accident and restore their lives. If you or your loved one has been the victim of a personal injury accident, contact the Downtown Miami personal injury accident lawyers at the Wolfson Law Firm at (305) 285-1115 for help. The Downtown Miami personal injury accident attorneys at the Wolfson Law Firm can help you and your family to get on the path of recovery. We can answer your questions. We are ready to help.